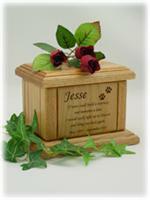 The large size in this series, this Memorial Poem Pet urn is made of a select grade of solid hardwood. 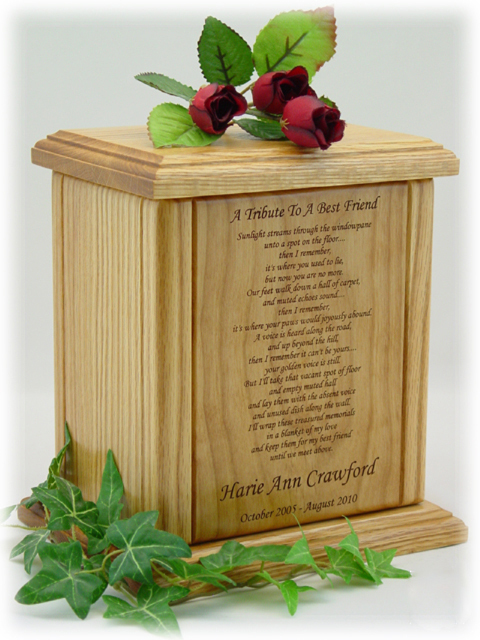 Purchase includes your choice of one of our standard 4 line poems along with your pet's name and dates and paw prints engraved right on the urn. 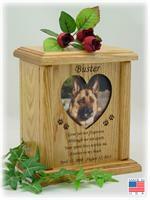 A Memory chest is an optional feature as well for holding some of your pet's precious items such as a lock of fur, collar or tags. A 2 mil. poly liner is included to place the cremains into before placing inside the urn. Closure: Bottom with Phillips Head screws.